We’d love your help. Let us know what’s wrong with this preview of Seven Wild Sisters by Charles de Lint. This full-color, illustrated companion novel to The Cats of Tanglewood Forest from two masters of modern fantasy is a captivating adventure about magic, family, and the power in believing in both. When it comes to fairies, Sarah Jane Dillard must be careful what she wishes for. She may have thought she wanted to meet the fairies of the Tanglewood Forest, but that was before This full-color, illustrated companion novel to The Cats of Tanglewood Forest from two masters of modern fantasy is a captivating adventure about magic, family, and the power in believing in both. To ask other readers questions about Seven Wild Sisters, please sign up. What is the book after Seven Wild Sisters that resolves Sarah Jane's story? This book was a gift My husband bought it from Amazon. I did I not. Can I rate it anyway? If not, Goodreads and I will be parting ways. Maybe I'm a bit like Sarah Jane Dillard in that I too "like to know the long history of a thing, not just where and what it might be now...(44-45)" because, having first read The Cats of Tanglewood Forest, I felt more connected to the tale of Seven Wild Sisters than its prequel/companion novel. What I loved most, about both books, was the relationship between women, especially a young female with her elderly counterpart. That tradition of the two living close together, and the old telling stories Maybe I'm a bit like Sarah Jane Dillard in that I too "like to know the long history of a thing, not just where and what it might be now...(44-45)" because, having first read The Cats of Tanglewood Forest, I felt more connected to the tale of Seven Wild Sisters than its prequel/companion novel. What I loved most, about both books, was the relationship between women, especially a young female with her elderly counterpart. That tradition of the two living close together, and the old telling stories to the young who, in listening to those stories, discovers a place and purpose - a sense of belonging, from someone who's already walked the different paths, who believes the wild tales no one else would believe. I think that type of relationship is important and I really enjoy how de Lint honored it in both books. Mart lent me this book back when we were talking about modern fairy tales. I loved the sense that fairy creatures had adapted or always existed in the hills and hollers, becoming bee fairies and sangmen rather than Sidhe and the Wild Hunt. But the story raised expectations that the Father of Cats -- or native panther -- might appear. While he was invoked, the story dodged around him. I was disappointed. I also felt that for a book that's only 150 pages, it wasn't necessary to waste 40 pages befor Mart lent me this book back when we were talking about modern fairy tales. I loved the sense that fairy creatures had adapted or always existed in the hills and hollers, becoming bee fairies and sangmen rather than Sidhe and the Wild Hunt. But the story raised expectations that the Father of Cats -- or native panther -- might appear. While he was invoked, the story dodged around him. I was disappointed. I also felt that for a book that's only 150 pages, it wasn't necessary to waste 40 pages before the story began. Especially since the characters of the sisters weren't introduced in any detail until after the story kicks in. The book read like the author was wandering around, waiting for the plot to reveal itself. I was tempted to put it down. A few years ago, over a number of years, I read more than a few of Charles de Lint's books. While I quite like some of his adult novels -- Trader and Yarrow are a couple of my favourites -- I've had mixed results with his books for younger readers. The Blue Girl was good. Dingo... not so much. And then there's Seven Wild Sisters... which again fell a bit short. It's listed as a Newford book on Goodreads, but all that really means is that it takes place in de Lint's fictional city and surrounding A few years ago, over a number of years, I read more than a few of Charles de Lint's books. While I quite like some of his adult novels -- Trader and Yarrow are a couple of my favourites -- I've had mixed results with his books for younger readers. The Blue Girl was good. Dingo... not so much. And then there's Seven Wild Sisters... which again fell a bit short. It's listed as a Newford book on Goodreads, but all that really means is that it takes place in de Lint's fictional city and surrounding areas. From what I can tell, this book wasn't a sequel or a prequel; you don't need to have read anything else to make sense of this particular story. 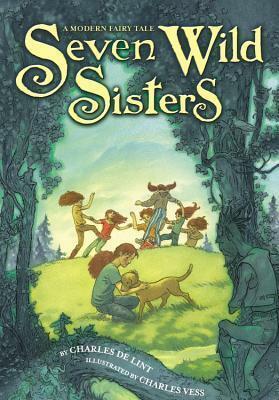 The story is very simple, a fairytale about seven sisters who find themselves swept up into the middle of a fairy feud. The whole thing pretty much takes place over the course of one day, so the story itself isn't that complicated. In fact, I found it a little too simple. I realize that it's supposed to be a book for middle-grade readers, but I had problems with that. The writing style is... well, it's de Lint's style. And I don't think it translates very well for younger readers. At times, the syntax seems too adult; at other times -- perhaps to compensate -- it almost seems dumbed down to the point of being condescending. The other problem I had with this particular syntax was that it made it very difficult to tell the girls apart. There are seven of them, ranging in age from sixteen to... ten? (I'm not sure if we were ever told the youngest twins' age.) That's a lot of characters to keep track of. The narrative switches back and forth between pairs of them (Adie and Elsie, Laurel and Bess, Ruth and Grace) and Sarah Jane, the thirteen-year-old middle daughter (whose sections are narrated in the first person). Sarah Jane's sections were the only ones that were really any different. With any of the other girls, it was difficult to remember which section I was reading, or even who was speaking in each section, because they all sounded alike. There wasn't a lot of difference between the speech patterns of Adie, the eldest, and Ruth and Grace, the youngest twins -- and I thought there should have been. There was some action in this book, but it fell really flat for me. I didn't ever feel worried for the characters or think that they might not come out of their predicament alive (even though there were a few threats of death throughout the story). Some of the inter-character conflict seemed like it was there just for the sake of conflict. The whole thing wrapped up a little too easily and neatly... and while it was sort of fairytale-esque in its simplicity, I was hoping for more. And when I say "more", I don't mean that bit of teenaged romance tacked on at the end. That was completely unnecessary. And there was one more thing in particular that really drove me to distraction. The archers in this story always "notched" their arrows. The word was spelled wrong in every instance. It's "nocked"... not "notched". If you're going to write a story with fairies shooting arrows, at least get the terminology right! Overall, I was not too impressed. I guess I should stick to de Lint's adult fare. I haven't had very good luck with his books for younger readers. "I like my familiar woods, watching the changes settle on them, season after season. I don't feel like a visitor anymore. I'm a neighbor now. I belong. And pretty as this place is, I don't belong here. I feel it like a buzz just under my skin. It's saying, 'You've got another home.'" I originally read this a couple of years ago in the original Subterranean Press release. When it came up as a group read this month, I noticed that the new middle grade version is around 100 pages longer and decided to compare the two editions to see where the differences lay. First, I've got to say that Vess's artwork - both the old art that now is colorized and the brand new art - is as gorgeous as usual. In terms of the text, I was expecting to see at least a little new content but to my surpr I originally read this a couple of years ago in the original Subterranean Press release. When it came up as a group read this month, I noticed that the new middle grade version is around 100 pages longer and decided to compare the two editions to see where the differences lay. In terms of the text, I was expecting to see at least a little new content but to my surprise, there's actually very little new content - there's a extra transitory paragraph here and there and a couple of sentences that cleared up minor continuity errors. Instead, there's quite a bit of content that was taken out. I won't go into the full details here, though I've talked quite a bit about it in the spoiler filled group read thread but in general, enough content was taken out to lower it from a Young Adult level book to a Middle Grade level book. Among some of the things that were removed were the girls' exact ages, any reference to current or future boyfriends, any hint of sexuality or puberty (including Aunt Lillian's sexuality), dropping out of school, and other random sentences the editors felt wasn't appropriate to a middle grade audience. They've also simplified the language a little bit in places and I noticed the characters did more emoting - stomping of feet, bursting into tears, etc - so they ended up seeming a little younger than they were originally. If they'd ever been a couple, I guess he'd been the one to end it. I already knew that Aunt Lillian wasn't too happy about it, but now I got the sense that maybe he wasn't either. I thought about some of the things he'd been saying, then looked at the pair of them. Old as she was with her own wrinkles and all, Aunt Lillian was probably more like an apple tree fairy now than she'd probably ever been in all the time he'd known her. Maybe the reason he'd been seeing less of her now than he used to wasn't so much because of what fairies can wake in a human, but because year by year she grew more attractive to him and he didn't trust himself around her. Figured they'd be happy for a time, but then she'd be gone, seeing's how our lives are so fleeting, while theirs go on forever. Maybe he just knew he couldn't bear the heartbreak. And maybe I was just being a hopeless romantic and there wasn't any such thing going on between the pair of them. As always, Charles de Lint delivers on a wonderful story. Add in the illustrations of Charles Vess, and this quick read is quite enthralling. A bit more YA than de Lint's usual Newford books, but still an enjoyable read. 7 red-headed sisters get involved (by accident) in a war between Bee Fairies and Ginseng Fairies. Everything works out. Seven Wild Sisters is a charming fantasy novel set in the modern world. The novel begins by focusing on the middle daughter, Sarah Jane, but by the end of the novel, all seven sisters have played a role in this delightful fairy fantasy adventure. The story begins, well, one could choose a dozen different "real" beginnings for this one, so I'll merely say the STORY FOR SARAH JANE begins when she befriends "Aunt Lillian." Aunt Lillian lives alone, secluded, near the woods. No electricity, no runni Seven Wild Sisters is a charming fantasy novel set in the modern world. The novel begins by focusing on the middle daughter, Sarah Jane, but by the end of the novel, all seven sisters have played a role in this delightful fairy fantasy adventure. The story begins, well, one could choose a dozen different "real" beginnings for this one, so I'll merely say the STORY FOR SARAH JANE begins when she befriends "Aunt Lillian." Aunt Lillian lives alone, secluded, near the woods. No electricity, no running water, no "modern" conveniences. No easy life for her. She wouldn't want to really slow down. She lives off the land; she lives for the land. She has almost seen it all. And by all, I mean she has had ENCOUNTERS with faeries and such. She is definitely different and in a way extraordinary. Sarah Jane, of course, LOVES her once she gets to know her, and from the start, Sarah Jane WANTS to get to know her. Sarah Jane's sisters are more reluctant perhaps, but, enter into this big adventure they will nevertheless! The other sisters include: Adie, Laurel and Bess, Elsie, Ruth and Grace. Sarah Jane's adventures start when despite Aunt Lillian's advice, she finds herself getting involved in "a war" between different faeries. She sees an injured 'Sang man--100 poisoned arrows piercing him--and helps him. The bee faeries are "the enemy" depending on which "side" you find yourself. Lillian KNOWS Sarah Jane put herself--and her family--at risk. But she'll do everything she can to help her out of the mess and into a big adventure she'll never forget. I was going through my personal wish list on Amazon (versus the library list that I keep on there), and thought that I should see if the library had it or not. Hey, they did. (Obviously) It's CdL, so I knew I'd enjoy it. I've read nearly all of his books (and own about three-quarters of them) It's relatively short, just under 150 pages, which include a few with art from Charles Vess, and while the story could easily be fleshed out to be a full-length novel, it fits perfectly with its length. It' I was going through my personal wish list on Amazon (versus the library list that I keep on there), and thought that I should see if the library had it or not. Hey, they did. (Obviously) It's CdL, so I knew I'd enjoy it. I've read nearly all of his books (and own about three-quarters of them) It's relatively short, just under 150 pages, which include a few with art from Charles Vess, and while the story could easily be fleshed out to be a full-length novel, it fits perfectly with its length. It's just a sweet story, with great characters and imagery. Sweet, simple, and with beautiful Charles Vess illustrations. The last act felt pretty rushed, as though this was planned as a longer book, and I could have used more of an idea of why L'il Pater helped the characters, and what he got out of it in a world that seemed to be otherwise pretty self-absorbed. (And he's a cat. Cats aren't exactly known for their altruistic nature.) This feels a bit like the opening chapters to a longer DeLint novel, but it's enjoyable for what it is. The images were what caught my attention and had me checking out this book. Unfortunately, despite sweet graphics that are very retro, the story fell flat. It felt like a whole lot of detail was left out. I'm guessing the book was targeted to 5th graders (ish) and that it has been awhile since the author was around young readers. Could have been a great story, but there was no world-building which is kind of crucial for fantasy fiction. With the beauty of its storytelling, art, characters, and setting, it truly is a hard place to leave. Very fun, very quick read about sisters and their visit to fairy land. I loved the voice, the characters, and really just about everything. This review has been hidden because it contains spoilers. To view it, click here. In Charles De Lint’s Seven Wild Sisters we meet Sarah-Jane Dillard, and her six sisters growing up someplace in Appalachia and their adventures with the faeries living in the hills. Sarah-Jane is the companion of Lily Kindred, an elderly spinster living on a homestead near the Dillard’s farm. Lily teaches Sarah all about the faeries, and how to respectfully treat them, and leads her to choose the homesteading life for herself. She is constantly helping Lilly and learning from her, but one day, S In Charles De Lint’s Seven Wild Sisters we meet Sarah-Jane Dillard, and her six sisters growing up someplace in Appalachia and their adventures with the faeries living in the hills. Sarah-Jane is the companion of Lily Kindred, an elderly spinster living on a homestead near the Dillard’s farm. Lily teaches Sarah all about the faeries, and how to respectfully treat them, and leads her to choose the homesteading life for herself. She is constantly helping Lilly and learning from her, but one day, Sarah finds herself in her own fairy story, accidentally involving her other red-haired sisters in the adventure of a lifetime. The faeries in Seven Wild Sisters are *not* Tinkerbell. They closely resemble their European counterparts, they are unpredictable, and some, like the antagonistic bee fairies, can be dangerous. The only truly trustworthy faerie is the Apple Tree Man, who has loved Lily for a long time. This version of the faeries is unfamiliar to Americans, and maybe frightening, but children who have previously read traditional fairy tales will soon adapt. The Bee Fairy Queen is much like the Queen of Hearts, screaming and pouting when she doesn’t get her way, even killing her own people when they dare question her, and disowning her own daughters when they marry into the Ginseng Fairy royal family. She is ultimately made to pay for her crimes as a longstanding feud comes to an end. Sarah-Jane and her sisters love each other and stand together when faced with the dangerous Bee Faeries, demonstrating that love is stronger than hatred. The Apple Tree Man goes out on a limb (pun totally intended) for the Dillard girls and Lily in getting himself involved in the feud between the Bees and the Ginseng. He does this out of love for Lily, and is truly an honorable being. It is clear that he loves Lily enough to stay away from her, as he is nigh-immortal and cannot watch her age and die in her world or watch her pine for home in his. In the end, Lily decides that she had enough of his games and chooses to stay with him. There is some violence involved in this faerie feud, starting with one of the Ginseng men getting filled with bee-arrows. There is some blood and threats of death toward the girls. Additionally, the book does describe a bit of the folk magic involved with thanking the faeries for letting people take from their realm. Sarah also discusses her discomfort with God’s omniscience, and some children may need to be guided through this. Also, one of the older sister’s hijinks involves running away with a boy. A nature lover's and folklore enthusiast's dream story. This is a short delightful book that is perfect for a summer afternoon. The artwork is stunning! Charles Vess's work holds a special place in my heart. The storytelling is as wonderful as you would expect from Charles De Lint. Seven gloriously red haired sisters live in the country in the Applachian part of Virginia. They're all very different from each other but deeply close knit. One of the middle daughters, Sarah Jane, develops a connect A nature lover's and folklore enthusiast's dream story. This is a short delightful book that is perfect for a summer afternoon. The artwork is stunning! Charles Vess's work holds a special place in my heart. The storytelling is as wonderful as you would expect from Charles De Lint. I read this book after The Cats of Tanglewood Forest and found it to be the same enjoyable type of story, just continued. I would be willing to read more in this vein. The story was interesting and could easily be accessible for a younger reader, but still enjoyable for an adult. While I enjoyed Seven Wild Sisters, the book is really about just one of the sisters; Sarah Jane. This is understandable given how short the book is, but I would rather have seen fewer sisters more fully drawn, instead of just lightly sketched. A beautiful story with lovely characters. We had not read any other stories about this world before this. I’m not sure if that made a difference in our experience. Either way, my daughter and I enjoyed it. A great read. An awesome and beautiful story full of sisters and fantasy. And the illustrations were beautiful! This book was described as a 'modern fairy tale'. It isn't. What it is, is clunky and convoluted. I found this one by chance, among the remainder books at Dollar Tree. Hard cover Charles de Lint for a buck? Yes please. Charming modern fairy tale with beautiful illustrations. Companion to The Cats of Tanglewood Forest. Worthwhile read. Loved the imagination of this book and the characters, although it was hard to keep the sisters straight. I have mixed feelings about this one. I would like to read other works by de Lint. I was intrigued by the characters. It seemed too simple at times or maybe too quickly resolved. A primeira vez que descobri Charles de Lint foi numa antologia de contos em que vários autores escreviam suas versões de contos de fadas. A forma como ele trabalhou a história dele me chamou tanta a atenção que fui atrás de mais, e assim foi que coloquei as mãos em The Very Best of Charles de Lint… e caí completamente de amores pelo estilo do cara. Por esses dias, encontrei Seven Wild Sisters - uma das obras infanto-juvenis do autor - em promoção na Amazon, numa edição toda ilustrada pelo Charles A primeira vez que descobri Charles de Lint foi numa antologia de contos em que vários autores escreviam suas versões de contos de fadas. A forma como ele trabalhou a história dele me chamou tanta a atenção que fui atrás de mais, e assim foi que coloquei as mãos em The Very Best of Charles de Lint… e caí completamente de amores pelo estilo do cara. Por esses dias, encontrei Seven Wild Sisters - uma das obras infanto-juvenis do autor - em promoção na Amazon, numa edição toda ilustrada pelo Charles Vess - de quem também gosto muito em razão dos trabalhos dele com Neil Gaiman. Não houve como resistir e lá fui eu comprá-lo. A primeira coisa que tenho a dizer sobre esse livro: ele é lindo. Sério, eu fiquei apaixonada pela delicadeza das ilustrações e pelo universo que elas nos revelam. As ilustrações são todas coloridas, a qualidade do papel é muito boa e fiquei feliz da vida com minha aquisição, porque comprei uma edição muito bem trabalhada pelo preço normalmente atribuído às edições mass market, de papel fino e sem cores. A história segue Sarah Jane - uma das sete irmãs do título -, que se torna amiga de uma senhora idosa vizinha no vale em que moram. Com tia Lillian ela aprende a cuidar da terra, descobre as histórias de fadas e, por um ato de compaixão, termina se colocando em meio a um feudo entre a corte das fadas abelha e os homens das nogueiras. Seven Wild Sister tem um enredo simples, mas confortável e satisfatório na maneira como se desenvolve. Adoro a forma como de Lint trabalha o folclore com a modernidade, como ele consegue fazer o extraordinário se tornar algo mais próximo e mais crível. As personagens, com ênfase nas sete irmãs, são interessantes - e mais de uma vez me peguei pensando em como esse era o tipo de livro que eu gostaria de ter lido quando criança, como Sarah Jane é o tipo de heroína com quem eu teria me identificado. Com toda a tensão que existe a partir do momento em que entramos no universo das fadas, levados pelo Homem da Macieira, é impossível deixar de sorrir toda vez que Lil’ Pater - um dos gatos da floresta de Tanglewood - surge. Lil’ Pater se insere na melhor tradição do Gato de Botas e o gato Cheshire e rouba a cena sempre que aparece. Sarah Jane Dillard has six sisters, older, younger, all with their own passions and interests and minds of their own. Sarah Jane loves nothing more than helping old Aunt Lillian on her isolated farm. Aunt Lillian tells wonderful stories of fairies and magic, which she insists are true, but Sarah Jane doesn't really believe her. Then one day Sarah Jane finds a real fairy, and before she knows it she and all her sisters are drawn into a long-standing war between two fairy clans. Sarah Jane must ge Sarah Jane Dillard has six sisters, older, younger, all with their own passions and interests and minds of their own. Sarah Jane loves nothing more than helping old Aunt Lillian on her isolated farm. Aunt Lillian tells wonderful stories of fairies and magic, which she insists are true, but Sarah Jane doesn't really believe her. Then one day Sarah Jane finds a real fairy, and before she knows it she and all her sisters are drawn into a long-standing war between two fairy clans. Sarah Jane must get them out before they are trapped forever. Seven Wild Sisters was originally published 2002 and is the 12th book in the Newford series. It's a bit confusing, but it seems like some of the books in the series are being re-released or recycled? In 2013 The Cats of Tanglewood Forest was published (for the first time it looks like) and Seven Wild Sisters is being billed as a companion novel to it. I have not read The Cats of Tanglewood Forest, or any of the other books in the Newford series for that matter, and still liked Seven Wild Sisters a lot. And it made me want to read The Cats of Tanglewood forest so I could know Lillian's story. While Sarah Jane was the main focus of the story and we learned most about her, I liked that the other sisters weren't just props. They had their own personalities and quirks. Adie is the oldest, and bit of a rebel without a cause. Elsie is fascinated with nature and draws plants and animals. The older twins, Laurel and Bess love music, and the younger twins, Ruth and Grace are mischief makers and practical jokers. They didn't all have big roles to play, but they were all part of the story. Sarah Jane feels a bit apart from her sisters. She doesn't feel like she has a talent. She's quiet and thoughtful like Elsie, but doesn't have something to focus on. She likes stories, and Aunt Lillian, who isn't actually her aunt, has plenty. She also finds she likes working with her hands. While Sarah Jane is trying to save her sisters from angry fairies, she's finding out the kind of person she is and who she wants to be. We really only get hints of the world in Seven Wild Sisters. I got a feeling that a lot more about the fairy world was learning in The Cats of Tanglewood Forest. Fairies aren't beautiful and sweet in this world. There are many different kinds of fairies some at war with each other. They all seem to fear and respect the King of Cats, who we hear about but never actually see. Less a full-out fantasy story and more a story of the relationships between the characters. The story mainly focuses on one sister, Sarah Jane, and her friendship with the simple-living Aunt Lillian. (Lillian is an "aunt" in the sense of everyone in town calls her that; no relation, but close friend.) Lillian has shared some of her stories of the fairy people who live in the woods and hills that surround Lillian's property. One day Sarah Jane encounters one of these fairy people who have been sh Less a full-out fantasy story and more a story of the relationships between the characters. The story mainly focuses on one sister, Sarah Jane, and her friendship with the simple-living Aunt Lillian. (Lillian is an "aunt" in the sense of everyone in town calls her that; no relation, but close friend.) Lillian has shared some of her stories of the fairy people who live in the woods and hills that surround Lillian's property. One day Sarah Jane encounters one of these fairy people who have been shot by arrows. After saving the fairy folk she finds herself, her sisters and Lillian embroiled in an old battle between the bee faries and the 'sangmen. The plot is heavily loaded on the friendship between Aunt Lillian and Sarah Jane. We are given a little bit of background information on Sarah Jane's six other sisters, but the story is mainly her's. Sarah Jane learns about Aunt Lillian's ways in living without a phone or electricity and her respect for the land around her. A wild herb that Aunt Lillian harvests is 'sang. She pays tribute to the spirits of the 'sangmen and teaches Sarah Jane to do the same. It is this that is the catalyst for Sarah Jane encountering the injured fairy. It is only the latter third of the book that concentrates on the fantasy aspect of the story. Once Sarah Jane gets mixed up in the fairy dispute, she and Aunt Lillian go to visit the Apple Tree Man. The Apple Tree Man is another spirit to whom Aunt Lillian feels very close. They seek his council on what to do. In the meantime, fairies begin to lure and kidnap Sarah Jane's siblings, snagging her deeper into the fairy dispute. This development is primary focus of the plot. It is really only the last 20% of the story that is completely entangled in the fairy world. The other 80% is set up in the human world. Still this makes for a good story. I enjoyed reading about Aunt Lillian and Sarah Jane's time together. You can tell in the writing that these two are kindred spirits themselves in a sense.